Bigger and better is the goal for the “Collide Back to School Splash” for students in high school and middle school sponsored by Collide. “Nothing has changed. We’re just trying to get bigger and get other churches involved,” said James Lain, student pastor at Maricopa Springs Family Church. Lain is one of four youth ministers who created Collide to bring together area Christian youth for fun activities and spiritual experiences. The Back to School Splash is set for Aug. 15, 6-10 p.m. at Copper Sky Recreational Complex. “At 6:30 p.m., we will start what we hope will be one of the biggest water balloon fights Maricopa has ever seen,” Lain said. There will be a “massive” slip ‘n’ slide and a splash tank. Keeping it cool, Maricopa Fire Department is scheduled to have a truck to spray down the revelers. A bungee run will be a test of strength in a safe and bouncy setting. And a gaga ball pit will sort out the last person standing. The event will be on the Great Lawn at Copper Sky. Church of Celebration Youth Pastor Cory Lehman said his group will bring its worship band. 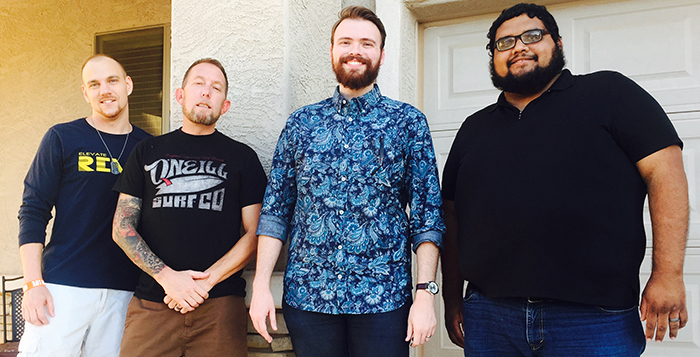 Calvary Chapel’s Michael Grigsby said his church’s youth band Relentless will also perform. For all the fun and entertainment, Collide’s purpose is spiritual connection. “Glorifying God is the main point,” Lain said. “This is a Christian event, and our goal is to bring the students of Maricopa together in worship to glorify God, and to show these students that they are a part of a bigger body – the body of Christ. The first time the youth pastors from Calvary Chapel (Grigsby), Church of Celebration (Lehman), Maricopa Springs (Lain) and Waypoint Church (Richard Benavides) combined for a Collide event was in February. Lehman estimated there were 50 participants.